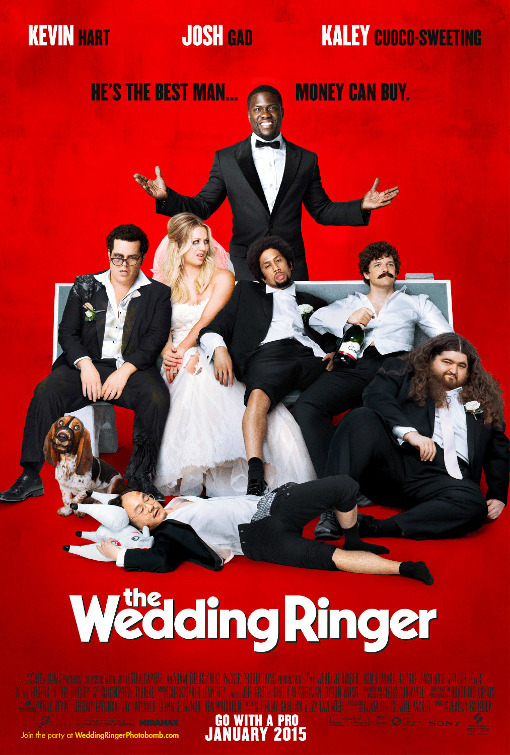 ‘The Wedding Ringer’ is that curious one in a million type film. Allow me to elaborate. The first thirty minutes or so are actually surprisingly entertaining and energetic. But after the half hour mark the fun considerably starts to thin and evapourate. Perhaps I should start at the beginning. The main and stand out stars of the film are Josh Gad and Kevin Hart. Gad plays Doug Harris who is getting married to Gretchen Palmer who is played by Kaley Cuoco-Sweeting with the depth of a female role in a Michael Bay film. Harris starts ringing his “friends” in the opening title sequence, which actually gains a decent amount of laughs in the process. All of them are unavailable and the excuses get more and more lame as he asks anyone no matter how long he has known them, whether they will be his Best Man for the Wedding. It goes from bad to worse when he has no members on the Groom’s side to help him out. He discovers that a man by the name of Jimmy Callahan provides Best Man services for people that are short of reliable friends. However, what he does not provide is a whole group of people for the wedding. Harris eventually convinces Callahan and then Harris agrees to pay him even when the price is substantial. He calls Callahan by the alter ego of his “Best Man” Bic Mitchum. Harris has to pretend that he has known Bic for a very long period of time and for a while it works. Not because he is clever but because his parents and girlfriend are inexplicably dumb and borderline retarded. How they do not realize that this is a blatant lie is plain stupid. As several incidents occur where his parents are getting to the bottom of how Harris knows Bic, only to be interrupted at the very last second. Maybe they should get their brains scanned. As I only briefly mentioned above for the first thirty minutes the proceedings are funny, rude and obviously crude. But the key thing is that they work. I have to admit that in several of the early sequences I was laughing uncontrollably. The film at this point was tip toeing the line between funny and repulsive. Unfortunately for ‘The Wedding Ringer’, an immolation gag later and it strides across the line and becomes horrid and actually quite nasty and vicious. I think after this point I mildly chuckled three times and that was mainly out of pity and disappointment. This is due to the combined charm of Josh Gad, Kevin Hart and the ensemble cast who try their utmost best to keep their dignity and the film together. I bought Josh Gad as a lovable loser because he never thinks too highly of himself and lacks confidence, even when he succeeds in his endeavors. Think of a larger, even less sure of himself Sam Gamgee and you are halfway there. His fiancée is beautiful but she is so poorly written that she is in need of some brain cells to make her character at least feel three- dimensional. He questions whether she really does feel the same way about him and whether he is the husband that she needs him to be. Okay. Not the biggest dilemma I know. But it is a comedy and the problems are always solved in a minute anyway. I actually felt for his character even when the film was vile, so there is that I guess. Kevin Hart brings charisma and likability to his role that gives the film an illusion of having a heart and a soul. It must be said that without Josh Gad and Kevin Hart I would have walked out of the cinema long ago. After a while the film gets bogged down in the core relationship that is as irritating as a wasp that keeps flying around your head. Leading the film to sadly become boring, too long and painfully unfunny, as it ends up lacking the jokes that made the first act fairly enjoyable and a guilty pleasure at the least. All I remember of the second act is the relationship struggles and there is no substance present there. Leading me to ask myself the question, why should I even care? Regarding the third act I would rather have amnesia than remember that sorry affair. It ends up being the lowest common denominator of comedy. Homophobic. If you want me to like your film here is a tip Director do not use this comedy. It is relentless, aggressive and hurtful. It ruins the charm and likability of the first act. I ended up hating ‘The Wedding Ringer’ and that is the honest truth. After a funny and charm filled first act ‘The Wedding Ringer’ is not content to let the actors have light hearted, playful and enjoyable fun. Instead we are treated with dire relationship drama we have all seen countless times before, tired gags, hateful homophobic jokes and tones upon tones of clichés. If you are asked to be Best Man for this Wedding decline immediately and sign up anywhere else.